Old Gerber knives are now collector’s items, even though the company is still in business as a subsidiary of Fiskars. Established in 1938-39 by Joseph ‘Ham’ Gerber, the original knives were made by David Murphy, who left the company to manufacture knives for the U.S. Army during the Second World War, although the very original knives weren’t made by the company at all. The well known Gerber knives first came into being in 1910 when Joseph, then an advertiser in Portland, Oregon, commissioned a local knife maker to make him twenty five sets of cutlery to give to his clients. They were so well received, and demand for them grew so rapidly, that he decided to leave advertising and set up his own knife company, Gerber Legendary Blades. This was an astute guy, used to spotting promotional opportunities for other people, spotting one for himself and changing his entire career on his own shrewdness and judgment. He deserved his success for taking such a chance. Some of the best knife manufacturers in the USA started out with Gerber, including Al Mar and Peter Kershaw, both much sought after knife makers themselves. There are a number of vintage Old Gerber knives made pre-1989 that are collectible, including the Celtic Knight folding knife. This is the Gerber Silver Knight 250A with a Celtic pattern on the bolsters and with jade scales that was made in 1979. There are many other folding Gerbers that are collectible such as the wooden Hunters and the Silver Eagle series, each representing the attention to detail and craftsmanship that make these among the most prized knives in America. This guy had an eye for beauty and practicability, and employed only the best people to design produce knives and cutlery that were the best of the best, which is why they have stood the test of time and are so popular to collectors today. Ingenuity and innovation are just as important as quality and dependability where old Gerber knives are concerned, and all of these qualities are represented in the range of fixed blade knives such as the presentation hunting knives and the Gerber Combo sets. The rugged Bowie knife is particularly impressive, and very collectible particularly if it offers a coffin style handle. Of particular interest to collectors are Gerber Paul knives, incorporating the Paul Poehlmann axial lock design. 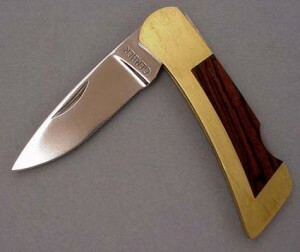 Paul used to make hand-made knives using his unique locking devise, originally developed in 1974, and entered into a contract with Gerber Legendary Blades for production knives to be made. These folding blades incorporated a mechanism that locked the blades in both the open and closed position in a far better way that had ever been possible previously, and the First Edition manufactured from 1977 became sought after the world over after production ceased in 1986. They are now keenly desired collector’s items. There are many other old Gerber knives that are sought after and if you have a chrome-plated handled fixed blade knife then it is certainly worth something, as are the Abercrombie and Fitch hunting knife range. The Big Magnum, Coho and Muskie are just a few of the named knives that collectors are looking for, and many of these and others are available online for collectors. Online auctions and collectors’ websites are popular places to find Gerbers such as the high quality folding knives, including the combat and fishing models, and also the range of combat fixed bladed knives and survival knives. The multi-tools, with scissors and pliers are very highly regarded, as are the sports axes. The beauty of collecting old Gerber knives is in the ingenuity that resulted in such a wide range of different types of knife for such a wide variety of purposes. Gerber collectors don’t just collect knives: they can specialize in what types of knife they collect, the folders being particularly popular, but they also collect what are literally fully functional works of art. To say there are over 60 types of collectible knife would not be an exaggeration, such was Gerber’s ingenuity and productivity, and not only is such a knife an item to be proud to own, but also great to collect. There is something about collecting knives, where you can feel the object in your hand and appreciate its design and balance, and the craftsmanship that has gone into making it from lumps of steel, wood, bone, or whatever materials were used. A knife is regarded as vintage if it is over 20 years old, and since old Gerber knives can be anything up to 79 years old, if you take the original set of 25 into consideration (they must be worth a bomb! ), then you have a fabulous interest that should keep you occupied for a lifetime. i have a gerber folding sportsman with sheath in mint condition. It has the tennessee state seal stamped in the brass frame, at the base of the blade.I was wondering about its value. I always like to defer to the experts when dealing with value or appraisals. Bernard Levine is just such an expert. I would recommend contacting him with any specific questions you have about your Gerber knife. You may contact him at http://www.knife-expert.com.